One of the more intriguing commissions to come my way recently, came from probably the first person to fully utilise all the various strands of my work these days. His name is Nik Thakkar and he is a young, gifted and driven account director at Exposure, a creative and publicity agency in London. He is also an avid blogger and tweeter; his blog Karl is My Unkle is fun to check into every day for its fashion and media observations. Way back before Christmas Nik asked me to sign an NDA before telling me that one of my all time fashion heros, designer Jean Paul Gaultier (it was those cone bras worn by Madonna circa 1990 that got me started) had signed up to be the creative director of Diet Coke for 2012. Would I be interested, Nik asked, in hanging out with and interviewing him in Paris to power the media story behind his collaboration across Europe? Uh, yeah! The first time I've been able to talk/write about this story is today. I was also able to develop my own story with Jean Paul in Grazia. The mid-April edition of Grazia will have that something special. Jean Paul is an under appreciated visionary who has given more to the contemporary fashion and style landscape than people realise. Me and JPG. You can tell I'm having a "I can't believe it" moment. 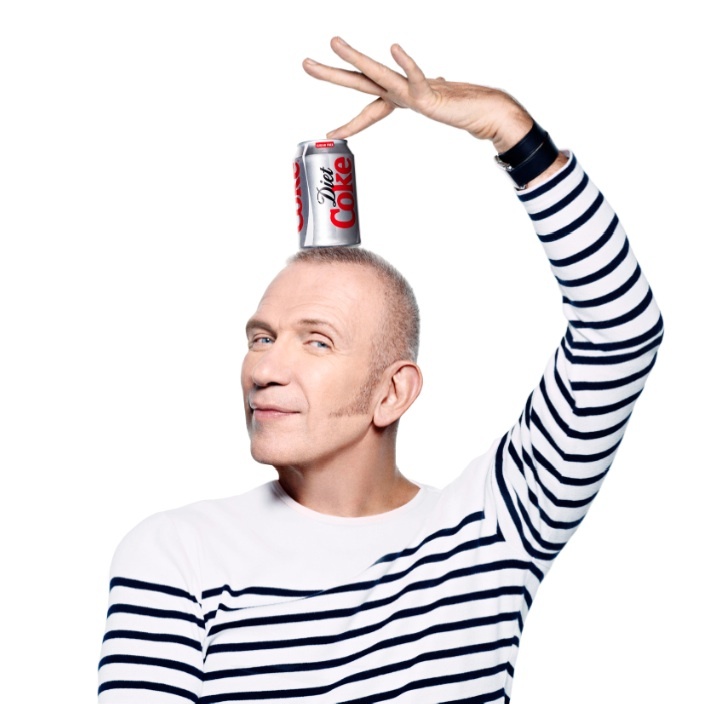 In the meantime, below is an insight into what Jean Paul has been up to with Diet Coke and how he has approached the work. I mean, how DO you go from Hermes to Diet Coke? His is a totally different connection than the one Karl Lagerfeld had two years ago when he worked with the brand. Jean Paul's involvement is more hands on; the fit between designer and brand is better too. JPG and DC are perfect fashion companions; we fell on the mini can of DC placed on our seats at his fashion show in Paris last Saturday like crazed hungry people, (it had been a long day). I'll start off with this very cute portrait of the designer who I cannot believe will turn 60 next month. Everything about him from the way he scampers down the catwalk at the end of his shows, to his joyful, youthful approach to life and work says this isn't so. Me: How did the collaboration come about? JPG: Well, when they contacted me I was like ‘ooooo’. I was very pleased that they approached me. It was a pleasure to say yes. I see the Coca-Cola writing and graphically it is so beautiful. I see it in red. It’s been part of my life since I was a young boy. What did they ask you to do first? I have made some films [see below for the first one], designed clothes for the puppets in the films and lots more still to come. I approached it in the same way as I do my perfume bottles - all in my spirit. When you are your rules for working with brands? In general, for every special project I have to use their code, respect their code but also be myself at the same time. So you need to get the right balance and that’s what I try to do on the bottles, glasses and dresses. I tried to see things in the Gaultier wardrobe and adapt and change them to treat them like couture in some way - it was like a game. So is all my work. At the end of the day, I am the lucky one because I am doing what I love. So like with Hermes, I looked at the codes of Coca-Cola. Now you’re no longer ‘enfant terrible’, who’s taking over from you? Enfant Terrible means someone who is not completely correct and who is a little rebellious. Who is rebellious now?! Maybe Gareth Pugh? Coca-Cola is the fashion industry’s preferred soft drink. Over the last 30 years have you seen any other fashion drinks? Coca light is definitely the fashion drink. You go to bars that don’t even have that much to do with fashion and it’s what everybody wants to drink. In ’92, when I was working with Madonna, I remember very well that it was Perrier. But on the radio they were saying that they’d found something toxic inPerrier. And so everyone stopped drinking it. At one moment, it very fashionable in France (I don’t know aboutelsewhere) to drink Irish coffee. I stopped drinking it when somebody told meabout a guy who died because he drank Irish coffee and then this lemonade/tonic drink and he died because of some kind of chemical reaction- frightening!You can imagine it going solid inside you, no?! Would you ever bring back Junior Gaultier [his cult diffusion line, which is much in demand on eBay] or work with H & M? Yes of course. I already did Target in the US. I always do couture but I like to touch people who don’t have as much money, so they can buy my clothes. When I did Junior Gaultier, it wasn’t just about doing a second line but it was to make something complementary that was just the price of a t-shirt, but with my shape and my print. I go at least once a week to the theatre. I like to see shows and concerts. I saw Amy Winehouse; I was so amazed at her voice even though I knew she was in such a bad state. Her look was incredible- 80s in a modern way. She was so me! I was so shy to go and see her because I admired her so much. I didn’t want that feeling of meeting someone you love and them hating you. Her talent was phenomenal and unique. She’s like an Edith Piaf for me in a way, the way she gave herself when she sings. Check out these two cute little film with JPG as "The Serial Designer"